It’s often been demonstrated—including in the show’s final episode—that behaving like the characters in Seinfeld should be grounds for your swift removal from polite society. The downright sociopathic selfishness that Jerry, George, and Elaine displayed, while pretty great for getting out of social obligations, probably shouldn’t be emulated in your own life, unless you have your own casting agency supplying a steady stream of incredibly affable friends and disproportionately attractive dates. And it should go without saying that all of Kramer’s get-rich-quick schemes are intended to be ridiculous, you impressionable idiot—and as one Michigan man is finding out, trying some of them could land you in jail, where you can live out your very own disappointing finale. As The New York Daily News reports, a Michigan man named Brian Everidge is currently facing a $5,000 fine and up to five years in prison for attempting to cash in more than 10,000 bottles and cans, taking advantage of the state’s plum, 10-cent deposit return. 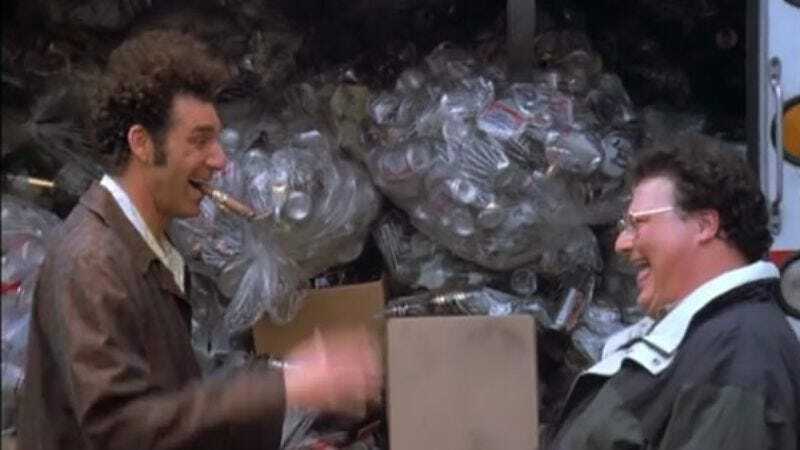 That’s the same plot hatched by Kramer and Newman in the 1996 episode “The Bottle Deposit,” using Newman’s truck and the Mother’s Day mail surge to ferry all the empty containers they can find. They even steal some from a homeless guy, which should be your first indicator that these are not the actions of morally just people. For Everidge, that ambiguity could be his saving grace, as his attorney has argued that—since he never specified he’d be returning them in Michigan, and no one actually caught him in the act—he’s not actually guilty of anything, and therefore shouldn’t have to stand trial. But the judge doesn’t see it that way, believing there was probable cause that Everidge violated Michigan’s strict state law against taking advantage of its love of recycling and looseness with dimes. Well, what about this: Ketchup and mustard in the same bottle?